Flipkart is India's largest e-commerce company headquartered in Bengaluru. It was founded in October 2007 & as of April 2017, the company was valued at $11.6 billion. Initially Flipkart started as a marketplace for books. 11 years down the line, it has products of more than 50 categories, a revenue of $3 billion a year with more than 30,000 employees working for it. So much has been the impact of Flipkart to the Indian market that, it's the "go-to place" for gen-next buyers. Even a global giant like Amazon is feeling the heat competing with the local behemoth. Known for its Big Billion Day sales, Flipkart has also launched its own electronics brand named "DigiFlip". 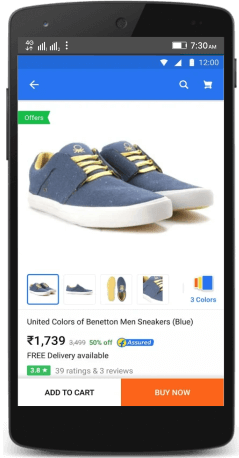 Available on both Mobile & Web, Flipkart claimed to have more than 300 million active users last year. Need to get started right away? Check out our ready-to-go eCommerce Mobile SDK. It's native & 100% customizable. Planning for an eCommerce App of Your Own? Andolasoft, a global web & mobile apps development company based out of San Jose, CA (USA) with an offshore centre in India can help you develop a Flipkart like app in quick time.